Discrimination in all its forms is sickening and is a cancer to society that has unfortunately metastasized to every facet of life. In shelters across America, it is a plain and simple fact that dogs and cats with darker coats are euthanized at a higher rate than their blonde and fairer coat counterparts at an alarming rate. 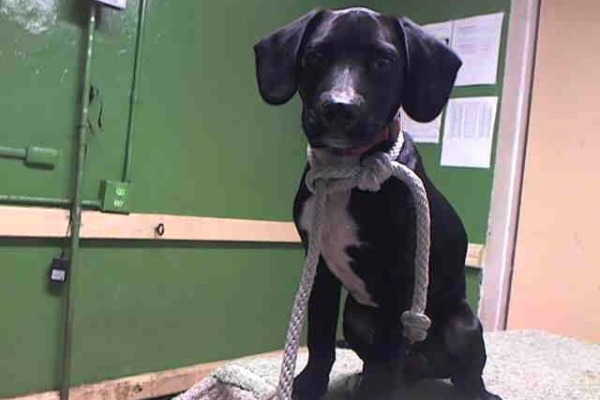 For one 3 month old male Lab Retriever, his new reality is caged in with him, at the high kill, Carson Animal Shelter in Gardena, California. The sweet pup, who always makes sure to greet shelter patrons with a cheerful upbeat attitude, is routinely passed up for adoption. My source at the shelter, who wishes to remain anonymous for this story says that the 10-month-old pup, is more than likely being overlooked because of the color of his coat, and I tend to agree wholeheartedly. Fidonation, if you or someone you know is interested in giving Leo the second chance he deserves, please contact the Los Angeles County Animal Control – Carson at (310) 523-9566 and reference the shelter ID #A5058647. Additionally, please share this story on Facebook or Twitter, so we are closer to finding Leo a home. We have done it before, and can certainly do it again.